Since 1978, Cornerstones Municipal Utility District has maintained a tradition of innovation, and built a reputation of promoting excellence in water resources development and management. We intend to continue that tradition on this website. We look forward to providing access to in-depth information about the District and its programs as a service to you, our residents, and we hope that you will access this web site for information about the District’s water services and other issues that are of interest to you. We also want to hear from you, and hope that this web site will be a productive source of communication between us. Cornerstones Municipal Utility District is located in West Houston, approximately two miles south of Interstate Highway 10 (Katy Freeway), on the eastern boundary of Mason Road. Portions of the District are in both Harris County and Fort Bend County. 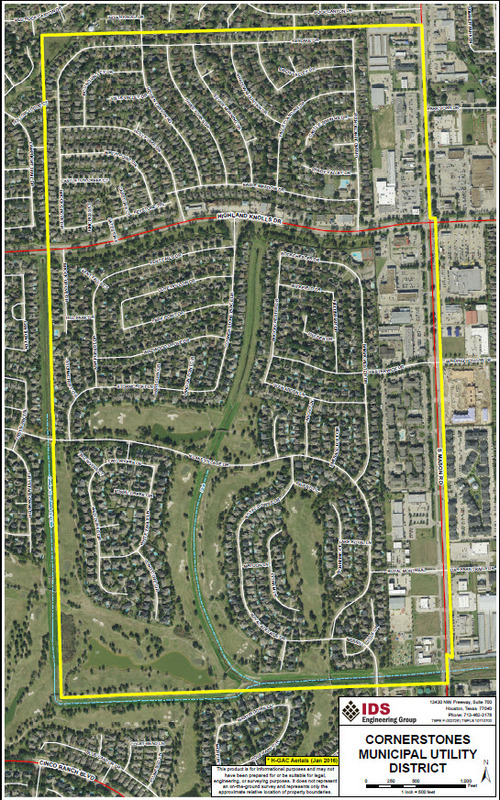 The Cornerstones Municipal Utility District’s service area includes the following subdivisions: Creekstone Subdivision, Sections 1 – 5; Cornerstone Place Subdivision, Section 1; Chesterfield Subdivision, Section 1; and Cinco Ranch North Lake Village, Sections 6, 7, 8 and 11.